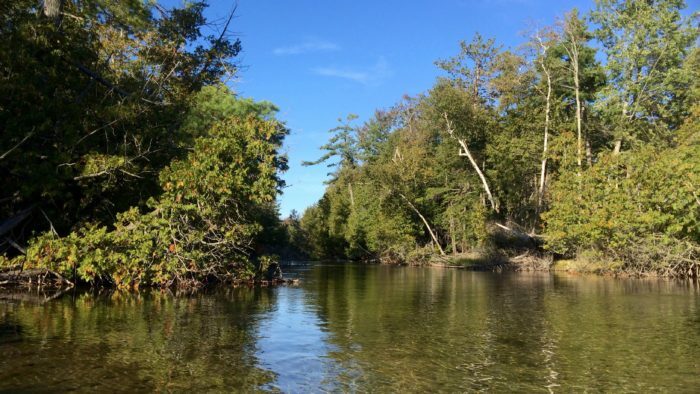 Crystal River is a gently moving, shallow stream in Glen Arbor. Do yourself a favor and kayak Crystal River. It is beautiful and peaceful. Crystal River is ideal for the entire family. 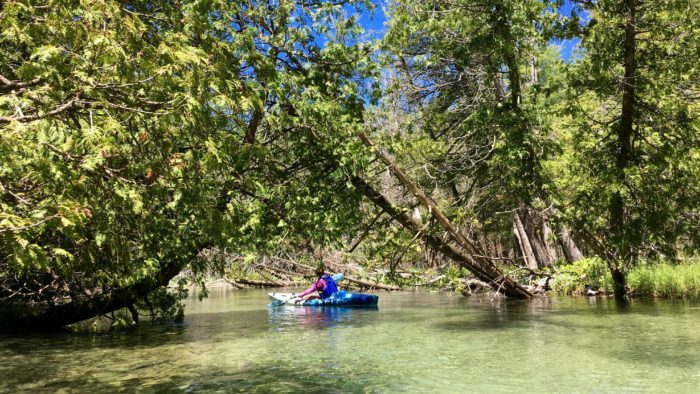 Crystal River by kayak is not like white-water rafting the grand rivers of the Appalachians or Rockies. It won’t sweep you along through white-water, or past grand cliffs. Crystal River is simple, peaceful beauty. 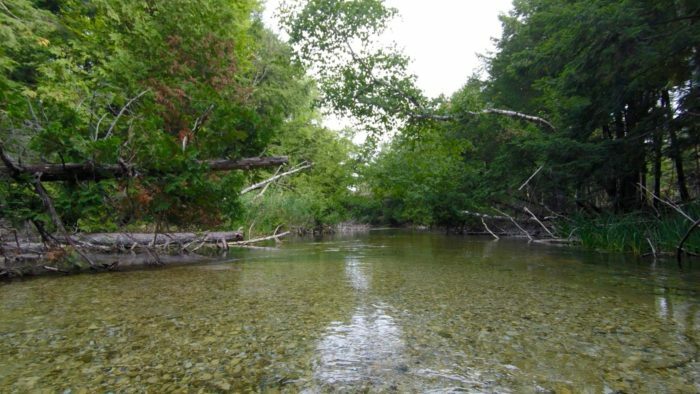 Crystal River is an excellent choice for those uncomfortable with the idea of being on a large body of water. All About Water has helped many families enjoy the river – everyone from young children to grandparents. 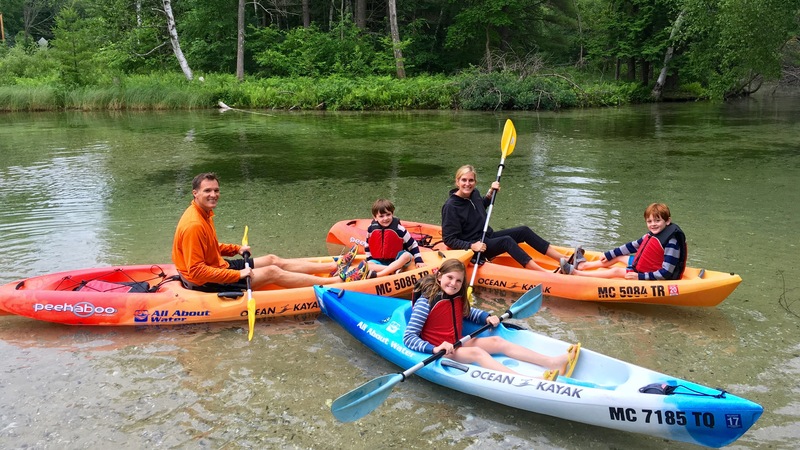 Small children can even ride on the same kayak with mom and dad. Much of the river is a foot deep. Take the time to appreciate the drinking-water-clarity of Crystal River. Notice the rocks, grasses, and sands that make up the bottom. Enjoy the peace and quiet provided by the woods and lack of development. 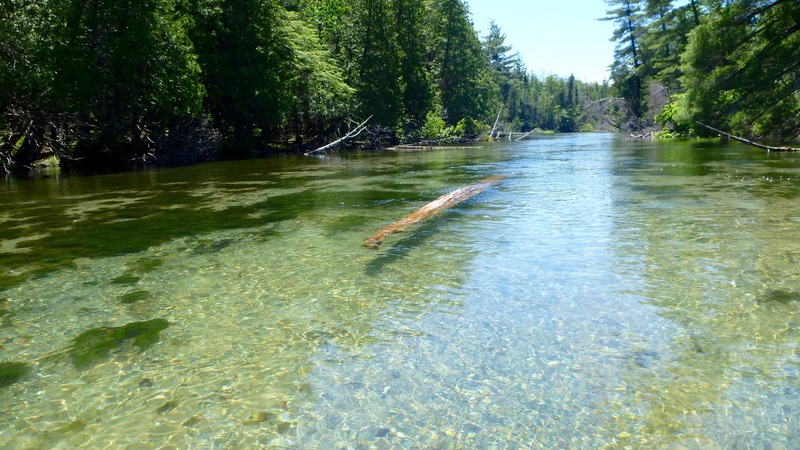 The National Park Service maintains the river in as natural a condition as possible while still making it accessible to the many visitors to Sleeping Bear Dunes National Lakeshore. 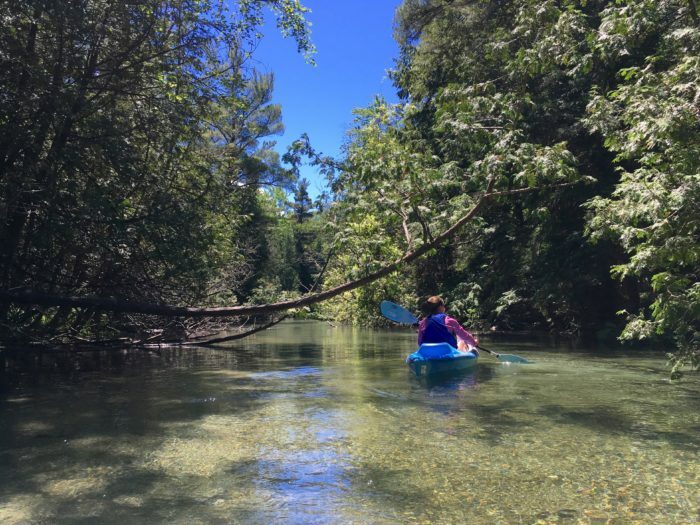 When you make the reservation through All About Water, you’ll paddle on a 2 mile stretch that is undeveloped. That’s right, there are no houses or buildings on the entire 2 miles. Enjoy! Crystal River is lined with trees that lean out and even across the river. Crystal River is a simple, special place. All About Water will shuttle you from our parking area at 5998 West River Road, Glen Arbor to the put-in at Fisher Road and CR 675 (also known as South Dunns Farm Road and/or West Crystal View Road). 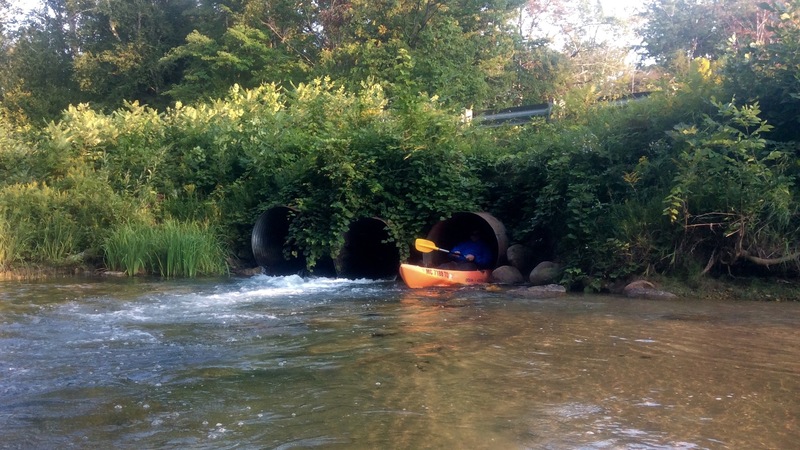 You’ll be on the water to just past the “shoot the tube” on CR675. 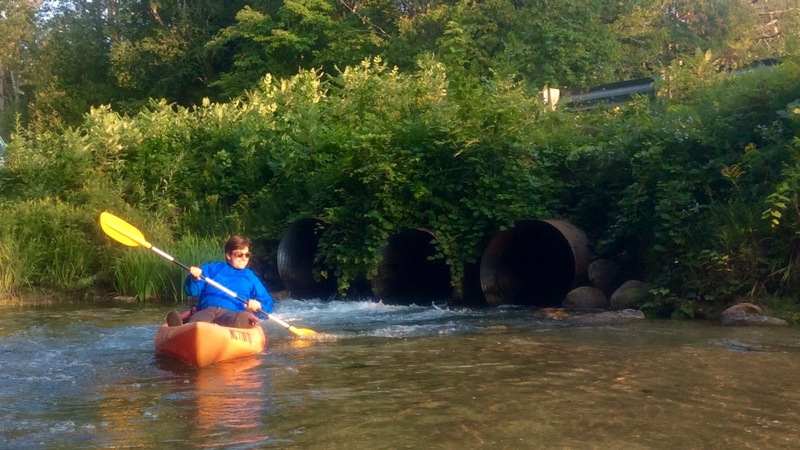 “Shoot the tube,” is a few seconds of excitement at the end of your peaceful trip. You can “shoot the tube” (go through the tube that channels the water under the road), or stop on the bank just short and portage (carry) your kayak across the road. There is a ramp down to the river that makes it easy to take out before the shoot the tube. It may look more intimidating that it is in real life. You can take out where those timbers are. This paddler chose to, “shoot the tube”! This is just over two miles on Crystal River. All About Water will pick you up at the take out there, and return you to the parking area at 5998 West River Road, Glen Arbor where you started. Some stretches of the river are narrow, and others are much wider. 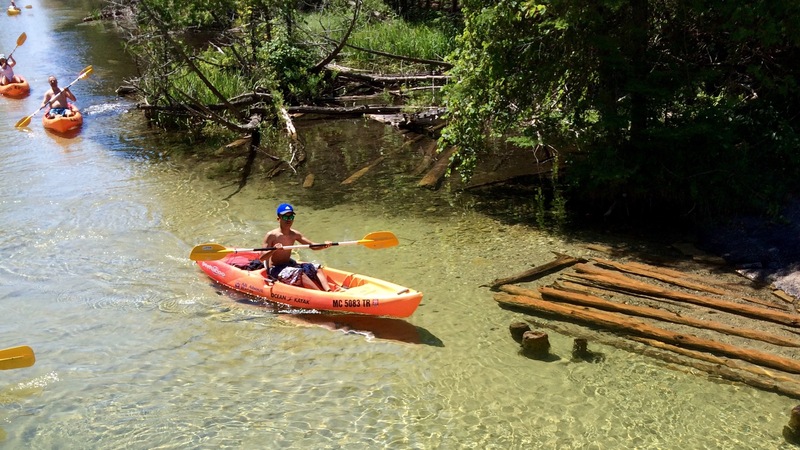 South Manitou Island is a beautiful destination with the shipwreck nearby in open water. A peaceful, beautiful place with lots of nature and few other people, this treasure is for you. This national park offers several great spots to explore and view the beauty of Lake Michigan.